On 100 acres near Nappanee, Indiana, Rod Mullet and his wife Terrie have rekindled his grandfather’s beef farm, even following the same methods that grandpa once used. But not before Rod left the farm for 16 years, the herd sold, and the barns sat empty. It wasn’t until a 4H project brought them back to the farm that the family enterprise was revived for a 4th generation to carry on. Growing up on the farm, Rod and his family would buy calves, just two to three days old, from a nearby dairy farm. Half of the animals birthed on a dairy farm are males, not useful for milk-production, and farms like Rod’s could make a business feeding out these Holstein steers for beef. “We raised them from the bottle until they were market ready,” Rod explained. And the beef was sold primarily in quarters and halves, called “freezer beef.” It was the popular way to stock up on good, farm-fresh meat in the 1980’s and 90’s. Customers came back year after year to fill their freezers, too. Rod’s grandfather and father grew their own high-quality hay, and fed a custom grain mix that was milled locally, too. “It was those ingredients that gave our beef that taste that kept customers coming back,” Rod says. But after high school, Rod started a career in construction. His brother left for college. And his dad, who also had an off-farm job, could no longer maintain the farm business alone. The herd was sold in 1994, and customers had to go elsewhere to fill their freezers. As he reflects on his story, Rod explains, “Our farm story, if you will, is basically one of me getting back to what I have always been passionate about.” What started with just a couple animals for a 4H project soon turned into a herd of 35 to 40. Rod bought breeding stock, managing the genetics carefully for show-quality cattle. 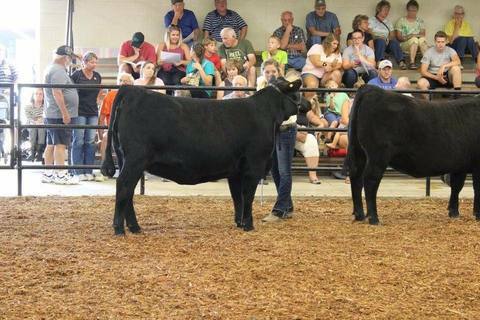 But when the shows were over, they started selling their cattle for freezer beef, just like grandpa did. Before long, the demand grew again. To keep up, they even picked up the old practice of taking in bottle-aged calves from a local dairy, too. They finish their cattle on the same hay and pasture that grandpa did. They even use a custom grain mix, just like the old days. And the flavor is second-to-none, just like when Rod was a kid. “In 2016 we formed Stumptown Cattle Company,” Rod explained, “I know I’m raising a premium product and I want as many folks as possible to experience it.” But even though the farming methods are vintage, one thing has changed since when Rod was a kid on the farm. “You know, 25 years ago, beef for the freezer was commonplace. But the generation today doesn’t know what it means to buy a quarter of beef.” So, Rod’s sales methods have had to adapt. You can find Rod and his kids’ home-grown beef on Market Wagon, not in quarters or halves, but individual cuts. Buy a-la-carte and get it delivered. Food grown the way grandpa did it, and available for purchase in a 21st-century market. Shop Stumptown Cattle Company right here on the online farmers market that delivers.